Millar Western has been in operation for over a century and producing lumber since the 1920s. Throughout our long history, we have established a reputation for quality, reliability and integrity. 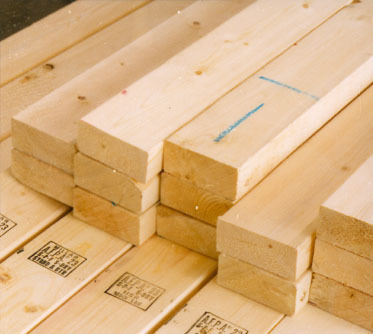 Spruce, pine, fir (SPF) dimension lumber is used in a variety of applications, including residential and commercial construction, fencing and decking. Our state-of-the-art sawmills in Whitecourt and Fox Creek, Alberta, produce 450 million board feet of kiln-dried spruce-pine-fir (SPF) lumber, in dimensions ranging from 1×3″ to 2×10″, and in lengths from 6′ to 16′. We also manufacture machine-stress-rated (MSR) lumber for engineered roofing and load-bearing applications, 5/4″ lumber and timbers for decking material, a high-quality J-Grade that would meet or surpass the Japanese Agricultural Standard (JAS), and other specialty wood products. Millar Western SPF lumber provides strength, stability and flexibility, making it the preferred choice of builders the world over. Each piece of Millar Western lumber is marked with a grade stamp indicating its quality and intended use. We grade our lumber according to demanding standards set by the Canadian Lumber Standards Accreditation Board (CLS) and the North American Lumber Grading Association (NLGA). The Alberta Forest Products Association regularly inspects our grading practices to ensure they comply with the requirements of these agencies. The timber used to make our lumber is harvested exclusively in Alberta, Canada, mostly from government-owned forests that, according to law, must be managed in a sustainable manner. The forests in which we operate are certified to the SFI® standards for sustainable forest management and fibre sourcing. Our lumber has also earned certification under the PEFC™ chain-of-custody program, assuring customers of the legality of our timber procurement practices. Wood building materials are good for the environment: they are renewable, biodegradable and recyclable, and they store carbon, resulting in a smaller environmental footprint than other building materials. The majority of our lumber products is shipped within Canada and to the U.S., but a growing proportion is destined for Asian markets. Our mills have access to sophisticated and dependable intermodal transportation networks to assure timely delivery to customers everywhere. A trusted name in forest products, Millar Western is ready and available to discuss your lumber needs. North American sales inquiries can be directed to our Edmonton office: mwfp@millarwestern.com. Overseas buyers may contact our exclusive international sales and marketing representative, Interex Forest Products Ltd.: info@interexfp.com. Part of the province's lumber industry since the 1920s, Millar Western is the largest Alberta-based producer of SPF dimension lumber.